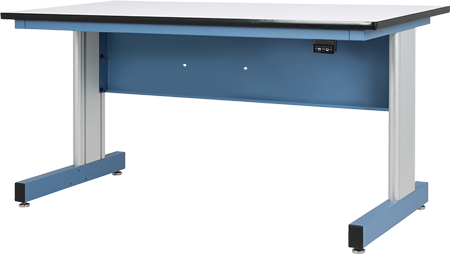 The ergonomically designed Quick Value Adjustable Height Benches deliver the efficiency and convenience of height adjustability at a remarkable price. We've engineered these workbenches for quality performance. A cantilever support system, housing the hydraulic lifters, provides maximum leg room, while the bolted steel channel frame delivers a full 500-lb. evenly-distributed load capacity. You can easily move up or down to the efficient functionality of a height adjustable worksurface. Adjustable Height (worksurface): 30" to 42"
Manual Adjustable Height: Height adjustment is manually controlled by a rotating hand crank positioned on the right or left side under the worksurface support frame and the crank folds out of the way when not in use. Motorized Adjustable Height: Height adjustment is electrically actuated via Up/Down pushbuttons. This controller is positioned on the right or left side, under the worksurface support frame.